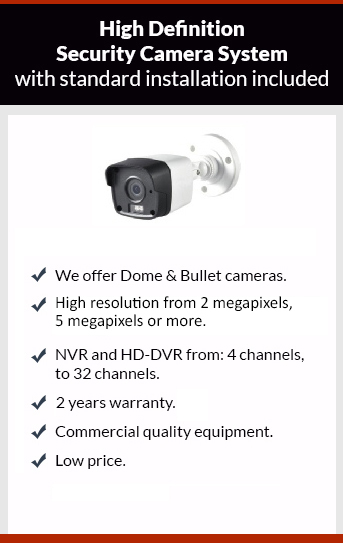 Get affordable Security Camera Installation on Hawthorne, CA and CCTV equipment with commercial quality and 2 years warranty. We have been working on Hawthorne, CA, since 2005. If you are looking to get a CCTV system you’ll see all the different options that are available on the market, from kits and CCTV companies. There are many things to look at besides low price, for example quality of the picture (resolution) and reliability of the security camera system. You can DIY if you want to save money on the security camera solution, but if you want a professional installation you have to choose a CCTV company. Some companies don’t have a good support on the products that they offer. Some companies buy their products from different vendors from China, depending on price not on quality. This makes their products extremely difficult for service. Protection4less have been working with the same quality brands from long ago. This makes the product easy for service and updates, that’s why we offer 2 years warranty in our products. Give us a call to get your appointment to get your free estimate.